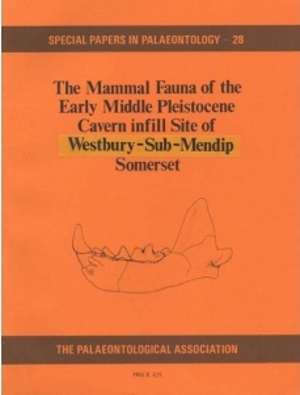 The mammalian remains from the cavern infill site near Westbury-sub-Mendip, Somerset, comprising forty-eight species, are described in detail for the first time. Three faunas can be recognized on stratigraphic and palaeoecological grounds. The first, Westbury 1, is a derived open woodland fauna recovered from the basal waterlaid sands and gravels, and may be a mixed assemblage, the faunal elements indicating any age between the Lower Pleistocene and the Cromerian. The second, Westbury 2, is a carnivore lair assemblage dominated by Ursus deningeri, recovered from a well-stratified series of cave sediments. The third, Westbury 3, is a small mammal fauna derived from an owl pellet accumulation, belonging to the same but slightly later part of the Westbury 2 temperate stage. The faunas of Westbury 2 and 3 probably belong to a temperate stage between the Cromerian and the Hoxnian, hitherto unrecognized in the British Pleistocene sequence. The Westbury stage almost certainly precedes the Anglian Glaciation, may represent a protracted temperate period following the end of the Cromerian Interglacial, and is tentatively correlated with palaeotemperature stage 13 of deep-sea cores. In Britain the only correlations that can be made are with Ostend, Norfolk, and possibly with the basal fauna of Kent's Cavern, but on the Continent correlations with a number of important sites are made, in particular Mosbach and Hundsheim. Westbury has yielded the richest carnivore assemblage and small mammal assemblage of any Pleistocene site in the British Isles, of which eight species described are new to the British Pleistocene. The Westbury 2 fauna is associated with finds of flints which may be artefacts, and as such would mark the earliest record of man's presence in Britain.